I’ve recently made the switch from one shot color, to mono imaging. My new camera is an older model ST-8300M from sBig. I traded my Starlight Xpress M25C for the ST-8300M, Optec 5 position filter wheel and 4 Astrodon 50mm LRGB filters. It was an even swap, no money exchanged hands. The new camera/filter wheel combo changed my imaging trains back focus, requiring a couple new adapters to make everything fit and come into focus on my Takahashi FSQ-106 ED. 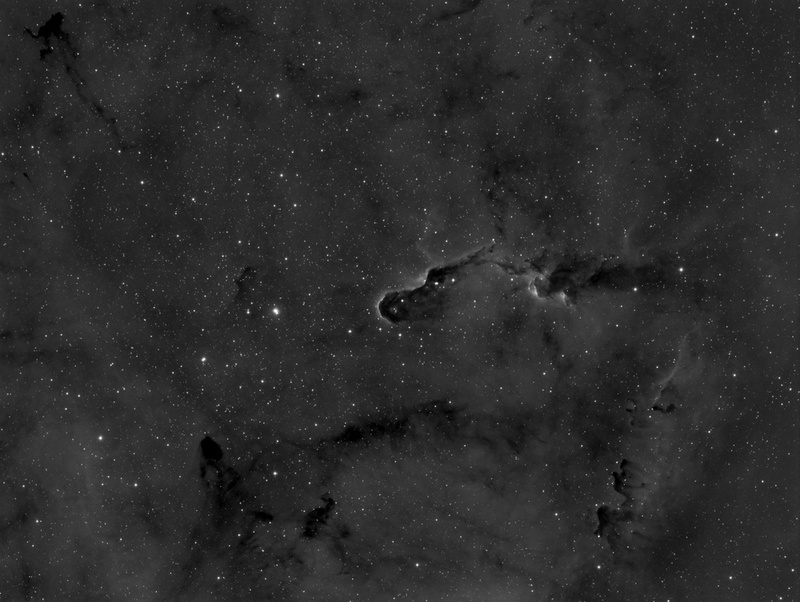 Luckily I’ve have had a couple of clear (ish) nights to get everything working and make sure have the right spacing to achieve focus and 2 clear nights to gather 400 minutes of HA data on the The Elephant's Trunk nebula aka (ic 1396). Getting rid of my trusted M25C was not an easy decision and if I could afford to, I would have kept it because it, it’s been a true performer for me over the last 2 years. The decision to go to a mono ccd camera was made because I have my scope set up in my garage all the time and I only need to wheel it out, polar align and in just a few minutes I can be gathering narrow band data. No need to wait for a moonless night, or drive to a dark site and hope the sky clears up from all the afternoon storms that form over the everglades every day 10 months out of the year down here. So for me, the complexities of narrow band imaging are worth it given that I will get a lot more time under the stars. I still treasure going out to the dark sites with friends and will go every chance I get. Here is my first HA image taken with the new set up. I plan on adding LRGB data as soon as I can. Hope you like this image as much as I do!